GRAMBLING, La. | Turnovers, turnovers, turnovers that was the difference in Saturday’s Southwestern Athletic Conference (SWAC) game as the Grambling State University football capitalized off seven mistakes and cashed them into 21 points in a 41-14 win over Alcorn State at Eddie G. Robinson Memorial Stadium. 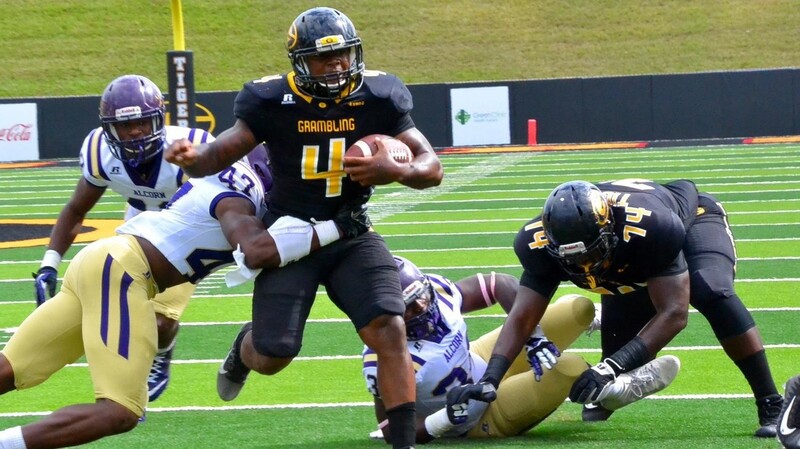 Grambling State (6-1 overall, 3-1 SWAC) led from start to finish in a matchup of SWAC Divisional leaders. The Tigers wasted little time in scoring as Grambling State took the opening kickoff and marched 69 yards in just two plays as Devante Kincade connected with Martez Carter for a 57-yard completion. Two plays later, the senior quarterback went 17 yards into the end zone untouched to give Grambling State a 7-0 lead with 14:06 remaining in the first quarter. Alcorn State (5-3, 3-1) answered early in the second quarter when De’Lance Turner scored on a 5-yard run to tie the game at 7 with 13:01 left in the first half. The Tigers would close out the first half strong as Calif Samon caught a 53-yard pass from Kincade to give Grambling State a 14-7 lead with 11:15 remaining in the second quarter. The Tigers took advantage of a fumble midway through the second when Ja’Quez Splond picked up the loose ball at the Alcorn State 25. Seven plays after the miscue, Grambling State cashed the turnover into points as Kincade connected with Marquise Kaigler for an 18-yard touchdown strike to extend the Tigers advantage to 21-7 with six minutes remaining in the first half. Grambling State capped the 17-point second quarter with nine seconds left as Marc Orozco booted the first of his two fields, a 40-yarder, to give the Tigers a 24-7 halftime lead. Orozco’s 33-yard field goal with 5:12 remaining in the third quarter pushed the advantage to 27-7 and it appeared the score would remain that way until the fourth quarter, but Dedrick Shy had other ideas. Noah Johnson’s pass was intercepted by Shy at the Grambling State 48 and he returned it for the pick-six touchdown to extend the lead to 34-7 with 43 seconds left in the third. Alcorn State answered the Grambling State score on its next possession as Turner bolted through the Tiger defense 47 yards for the score to cut the deficit to 34-14. The Tigers added the final score of the day when Miguel Mendez booted a 48-yard punt and the ball bounced off the hands of Marquis Warford and into the endzone where Quintin Guice pounded on it for the touchdown as Grambling State cruised to a 41-14 victory. Good teams win by not turning the ball over and Grambling State took advantage of seven Alcorn State mistakes. The Tigers sacked Braves quarterbacks seven times and the defense surrendered 363 total yards to Alcorn State, BUT the turnovers played a huge factor. With Grambling State leading 14-7 midway through the second quarter, Ja’Quez Splond registered a fumble recovery and seven players later the Tigers cashed it into seven points (21-7). Dedrick Shy returned an interception back 52 yards for the pick six and Quintin Guice pounded on a loose ball fumble in the end zone. Alcorn State gave up 21 of the 41 points on turnovers, which in turn was the difference in the game. The box score for this game is available here. Grambling 3-1 in the SWAC? What SWAC team did Grambling lose to?? ?